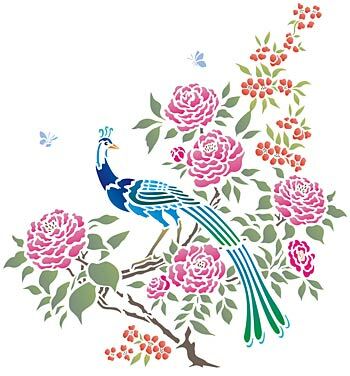 The beautiful Peacock Bird and Blossom Stencil is a fantastic 2 sheet stencil with an exotic peacock and bird of paradise motifs and full blown roses and blossom sprays. 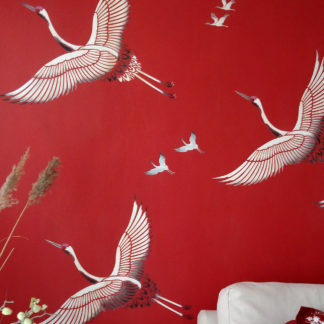 Use this versatile design on fabrics, clothing, cushions and as chinoiserie motifs on walls and furniture. See layout and size specifications below. 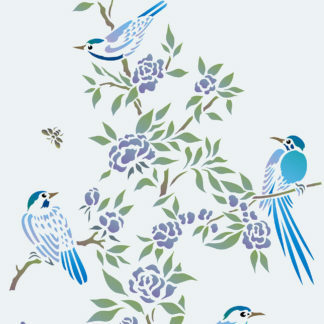 The beautiful birds and blooms in this 2 sheet stencil, are taken from our full scale chinoiserie stencils and can be used individually or together in different arrangements and with our other Chinoiserie Stencils. This stencil design suits a range of different colour treatments – working in both single colour schemes and multiple colourways. Some suggestions and examples shown here. 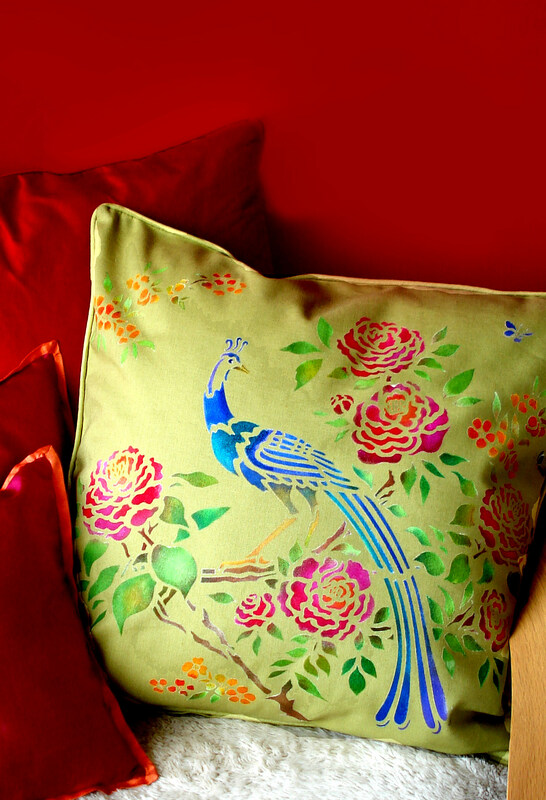 Above top and below – create stylishly stunning cushion covers with the Peacock Bird and Blossom Stencil. Stencilled onto a lime green cotton cushion in Motif Fabric Paint – Strawberry Red, Magenta Pink, Sunny Yellow, Bright Purple, Cobalt Blue, Turquoise Green, Bright Green, Leaf Green and Terracotta. Above – close up detail of the cushion cover as described above. To achieve this kind of luminosity of colour stencil first with Pure White Fabric Paint, allow to dry and then stencil with the colours on top. 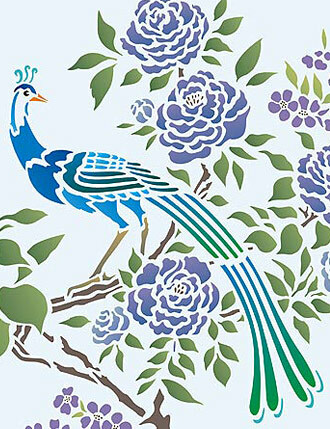 Above – the two motifs of the Peacock Bird and Blossom Stencil arranged together and stencilled in Persian Blue, Paradise Blue, Duck Egg, Emerald Forest, Eucalyptus, Mocha, Indian Purple, French Lavender and Forget-me-not Stencil Paints on a pale blue background. 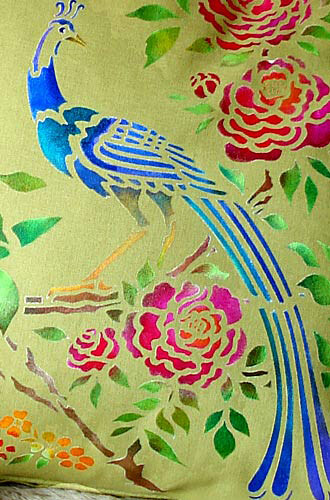 Above – close up detail of the peacock motif of the Peacock Bird and Blossom Stencil – stencilled in Persian Blue, Cyan, Emerald Forest, Hedgerow, Verbena, Mocha, Plum Blossom and French Lavender Stencil Paints on a pale blue background. 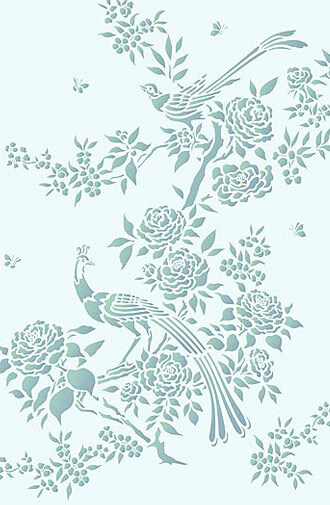 Above – the two bird motifs of this stencil arranged together and stencilled in the subtle tones of Duck Egg and Willow Stencil Paints on a pale aqua background. 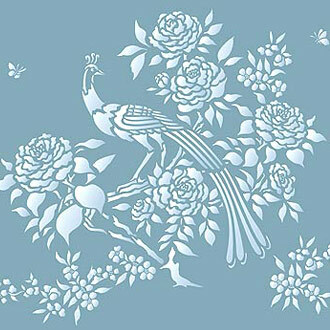 Above – the two bird motifs of the Peacock Bird and Blossom Stencil, stencilled in Ice White and Duck Egg Stencil Paints on a chalky blue background. 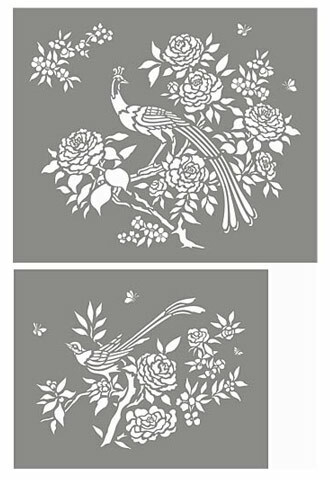 This stencil can be used in conjunction with our Birds and Blossom Stencil, as well as Chinoiserie Stencil 1 and Chinoiserie Stencil 2 for a complete look. Above and below – create this elegant silk evening maxi dress with the motifs of the Peacock Bird and Blossom Stencil and Motif Fabric Paint. Stencil the motifs ‘growing’ up the dress in bright colours that emphasise the different motifs of the flowers and birds. 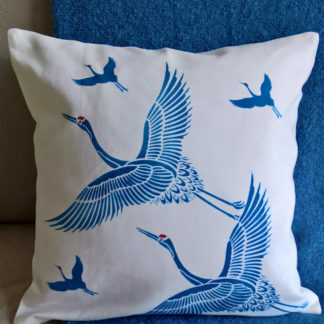 Fabric Paints used here include Pure White, stencilled first, over-stencilled with Strawberry Red, Magenta Pink, Sunny Yellow, Bright Green, Cobalt Blue, Bright Purple, Cobalt Blue and Taupe. Stencilling onto fabric is very easy. Apply repositionable spray adhesive to the reverse of the stencil, lay the stencil onto your fabric with a protective sheet of paper in between the layers of cloth and stencil with our Fabric Paints and Stencil Sponges. Iron on the reverse side so the paint becomes fast and you are ready to wear! (Fabric Paints come with full instructions). 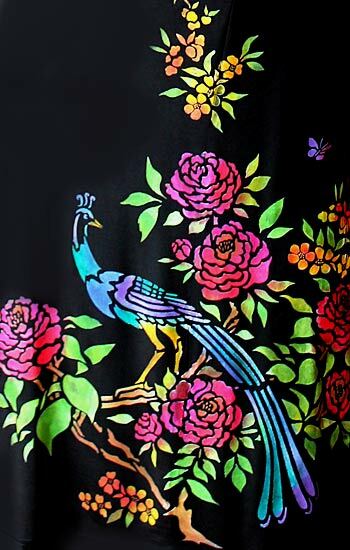 Above – close up detail of the peacock motif of the Peacock Bird and Blossom Stencil on black silk evening dress. Fabric Paints used – Pure White, Strawberry Red, Magenta Pink, Sunny Yellow, Bright Green, Cobalt Blue, Bright Purple, Cobalt Blue and Taupe. To achieve this kind of luminosity of colour stencil first with Pure White Fabric Paint, allow to dry and then stencil with the colours on top. 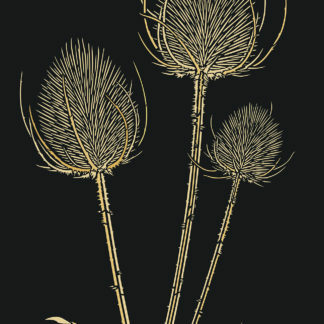 Above – shows how the back of the evening dress has been stenciled with the bird of paradise motif of this stencil pack and repeated rose motifs. 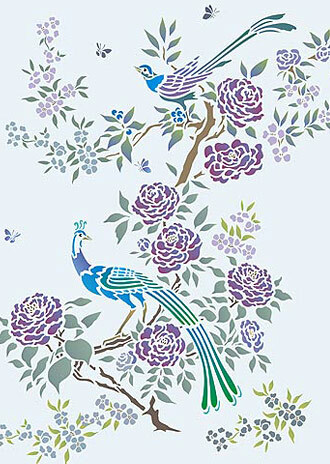 Above – the two bird motifs of the Peacock Bird and Blossom Stencil arranged together and stencilled in multiple colours on a pale pink background. Stencil Paints used – Indian Purple, Cerise, English Rose, Very Berry, Persian Blue, Cyan, Woodland, Verbena, Emerald Forest, Willow, Mocha and Harvest Gold Stencil Paints. 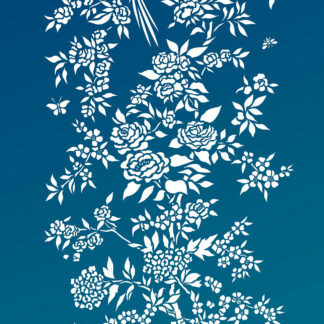 Above – the peacock motif of this stencil with the small additional flower motif, stencilled as a single motif group – this stencil will allow you to use motifs individually or add them together to ‘grow’ into different layouts and sizes. 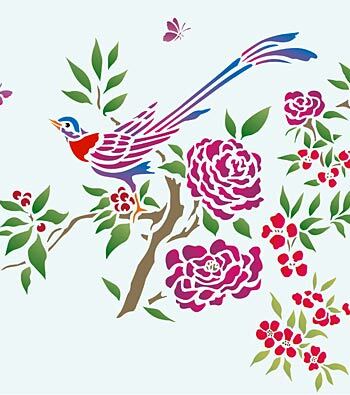 Above – the bird of paradise motif of this stencil in the bright hues of Cerise, Very Berry, Indian Purple, Persian Blue, Woodland, Ash Green, Verbena and Mocha Stencil Paints on a pale blue background. Easy to use one layer stencil on two sheets of 125 micron mylar. 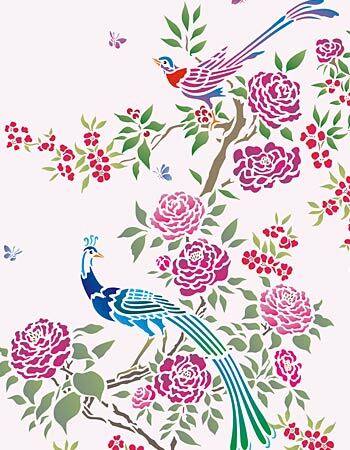 Sheet 1 comprises the peacock motif on a flowering rose bush, additional spray of flowers, two butterflies. 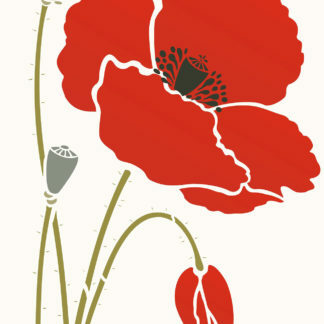 Whole motif up to 46cm (18″) wide x 39cm (15 1/4″) deep at widest points. Peacock motif up to 38cm (15″) diagonally from crest to tip of tail. Roses up to 9cm (3 1/2″) across at widest points. 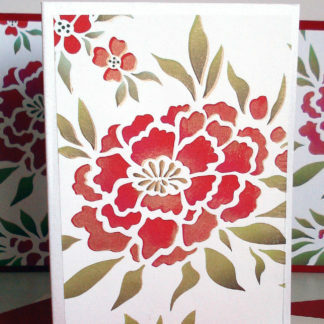 Additional spray flower motif up to 18cm (7″) across at widest point. Sheet size 55cm (21 1/2″) wide x 45cm (17 3/4″). 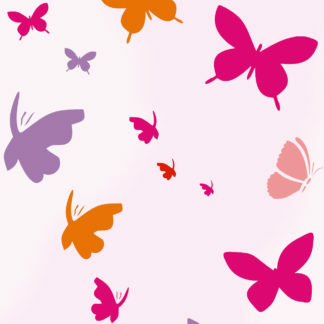 Sheet 2 comprises the bird of paradise motif on a flowering rose branch, two additional butterfly motifs, bee motif. Whole motif up to 39cm (15 1/4″) wide x 29cm (11 1/2″) deep at widest points. Bird motif up to 26cm (10″) from beak to tip of tail. Sheet size 32cm (12 1/2″) wide x 60cm (23 1/2″”). Left – shows the layout of the two sheets of the Peacock Bird and Blossom Stencil.